Bed bugs DO NOT discriminate. While most people consider bed bugs to be in mattresses, other common areas include carpet edges, night stands, dressers, shelves, suitcases, and laundry piles. Suitcases and laundry piles are excellent ways for bed bugs to travel and infest a non-affected area. Whether your hotel is budget or luxurious, you’re at the same risk. With the increase in domestic and international travel as well as a lack of public knowledge, bed bugs are back. As a Hotelier, you need to know the prevention techniques, signs, and eradication methods to ensure your hotel or motel is free of bed bugs. If there was a way to prevent bed bugs from showing up in your hotel or motel, there wouldn’t be sites such as BedBugRegistry. While the site has no verification process, your reputation can be greatly affected from just one customer reporting an issue. While you can’t necessarily prevent bed bugs, you can lessen your chances of infestation. Ensure your mattresses are encased. Ensure your box springs are encased. Teach housekeeping staff how to check and look for bed bugs (See Below). Make sure bed skirts aren’t touching the floor. Bed bugs can’t jump, but they can crawl vertically. Provide customers with laundry bags to put dirty clothes in the bag, not on the floor. Regularly wash and heat-dry sheets, blankets, bedspreads, and duvets. The average female bed bug lives for 6-12 months. Laying approximately 1-5 eggs per day, the average female can lay 500-600 eggs in a lifetime. Each egg takes 10 days to hatch, therefore it’s critical to detect and treat infestations early. Use the following pictures and tips as a guide to help spot bed bugs. 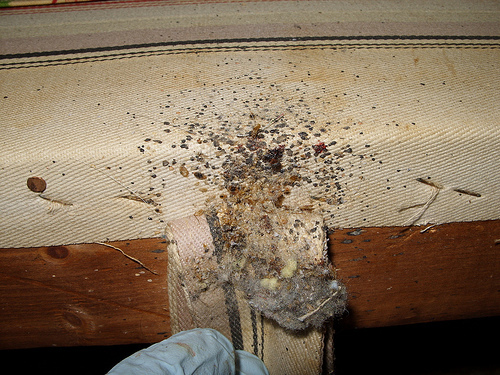 Bed bugs are not independent, as they multiply, they move and feed together. If your housekeeping staff or a guest reports bed bugs, make sure to follow our steps to help eliminate any further infestation. Do not move furniture or other items away from the room. Do not ignore the situation, bed bugs can live up to a year. Bed bug aerosols and vacuums are effective, but won’t eliminate 100% of the problem. Deciding to solve the problem yourself can often times lead to further problems. While “Do it Yourself” methods exist, they’re not recommended for commercial properties. Choose a reputable company such as Orkin or Terminix to help eradicate your bed bugs. Bed bugs can live in small cracks and crevices, unreachable to aerosol products. With the right temperature and warmth, bed bugs can be dormant one day, and multiplied by the next. Full grown adults can go without food for almost a year, therefore a room that’s unoccupied can still be infested. Know the facts. Train your staff. Spot bed bugs early. Seek professional help.